Punk rock fans get ready for the biggest and most unmissable event you will witness this coming summer! That's right the 70's band Social Distortion are RETURNING and will be taking to the road…. stopping off at venues on the way to give fans a chance to catch the LIVE! To be part of this insane and epic crowd – book your ticket today and head to Stage AE on Thursday 3rd August 2017! Now with an incredible catalogue of seven albums under their belts + plenty more where that came from! 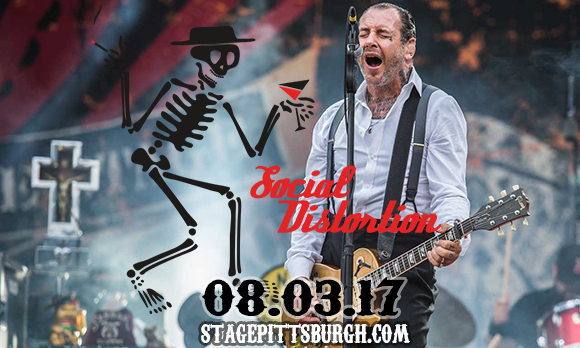 Social Distortion are touring summer 2017 to bring all their best and most loved anthems to life! "Ball and Chain", "Story of My Life", and the cover of Johnny Cash's "Ring of Fire", and much much more – grab the opportunity to be there!! !